Employees of Southeastern Freight Lines, the leading provider of regional less-than-truckload transportation services, have completed their 2018 United Way campaign with a total of more than $140,000. The Southeastern Freight Lines employee campaign was led by Stephanie Cullum, Jessica Oswald and Alison Sturkie. Southeastern also supports United Way’s efforts to increase childhood literacy through 17 volunteers who participate in the Midlands Reading Consortium, a program designed to match tutors with K-2nd grade students for one-on-one tutoring throughout an entire school year. Thanks to partners like Southeastern Freight Lines, United Way is leading the charge in improving quality of life in the Midlands by working to prevent homelessness, to provide affordable eye and dental care, and to prepare children to enter kindergarten ready to learn and graduate high school on time. What do you think about the Self-Sufficiency Standard? The United Way Association of South Carolina is conducting a survey about The Self-Sufficiency Standard and would love to know your thoughts, feelings and needs surrounding the Standard. Organizations who participate in the survey will be entered into a drawing of a $150 gift card provided by the United Way Association. Two organizations will be selected from the drawing. To be eligible for this drawing organizations must submit the survey by August 31st. Winners will be announced by September 12th . To take the survey please click the link below. Thank you for your participation. New Self-Sufficiency Standard for SC Released! The United Way Association of South Carolina, with support from its generous sponsors, and in collaboration with the Center for Women's Welfare at the University of Washington School of Social Work, are pleased to present The Self-Sufficiency Standard for South Carolina! 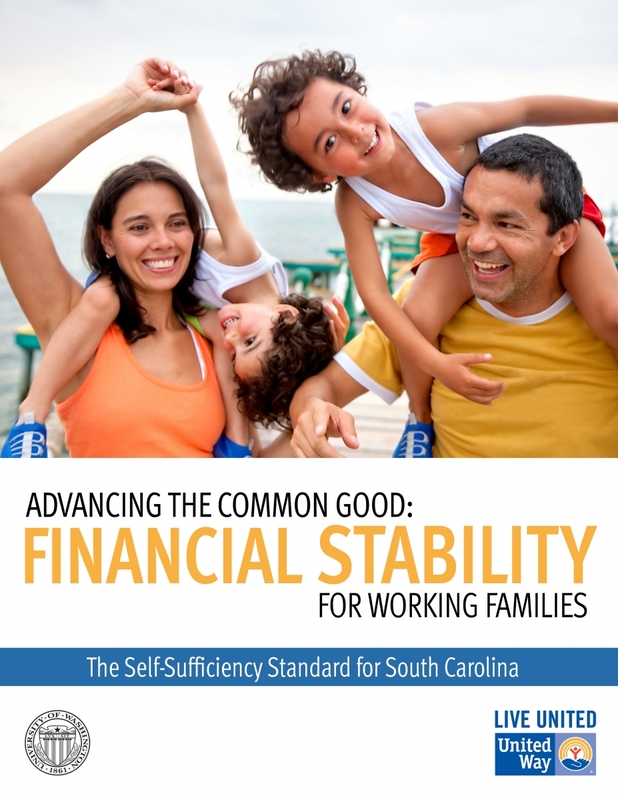 The Self-Sufficiency Standard for South Carolina 2016 was published in an effort to ensure the best data and analyses are available to enable South Carolina’s families and individuals to make progress toward real economic security. The result is a comprehensive, credible, and user-friendly tool. The measure describes how much income families of various sizes and compositions need to make ends meet without public or private assistance in each county in South Carolina.